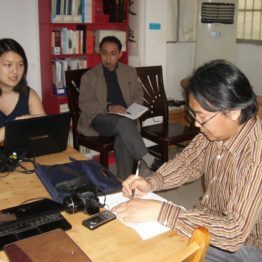 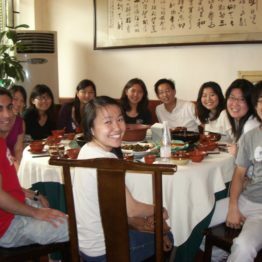 China Team leader Amy Liu talks to the leader of a Sichuan NGO that will start a microcredit program with a start-up fund from the students. 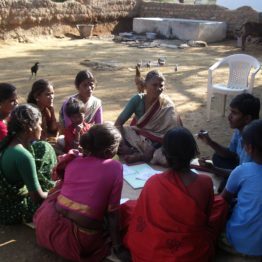 Women meet to discuss taking loans under the NGO Ankuram Sangamam Poram with 80,000 women in 1500 villages in the state of Andhra Pradesh. 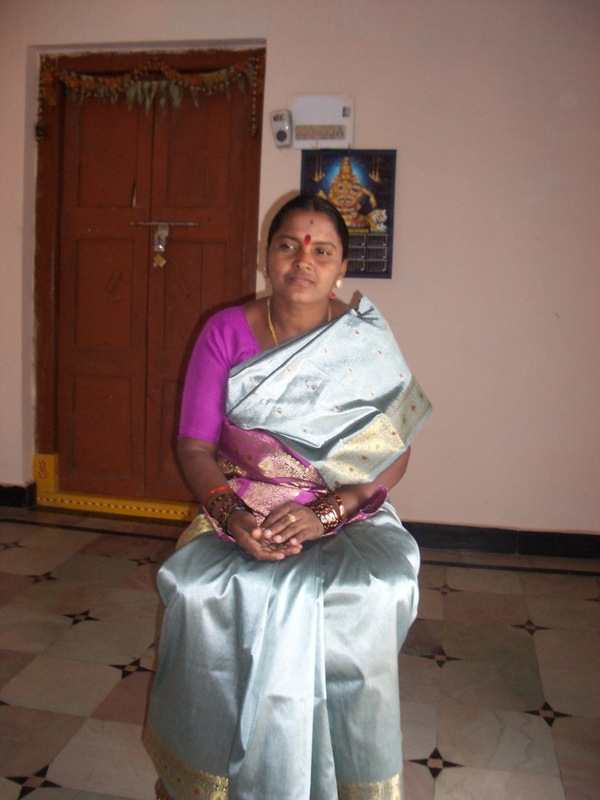 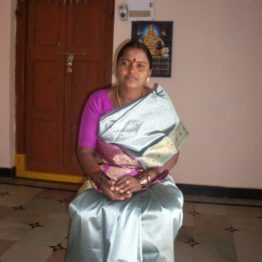 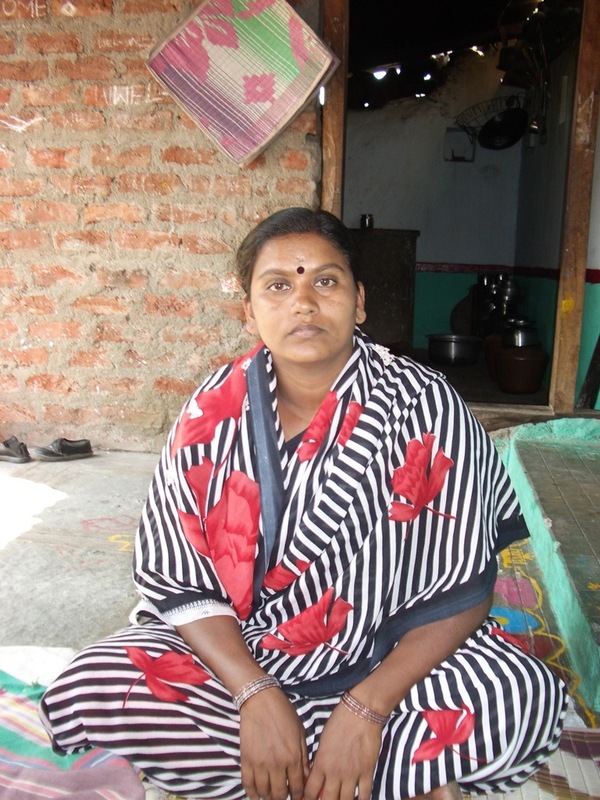 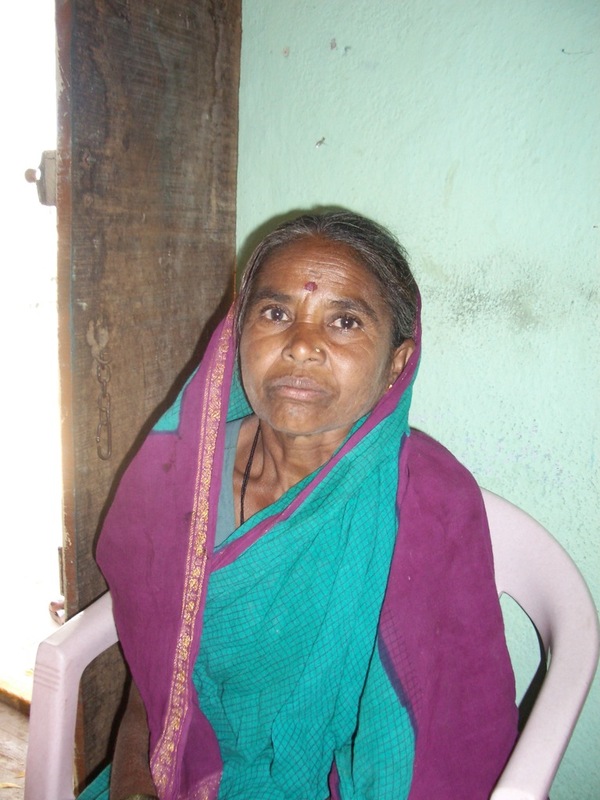 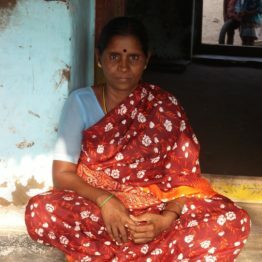 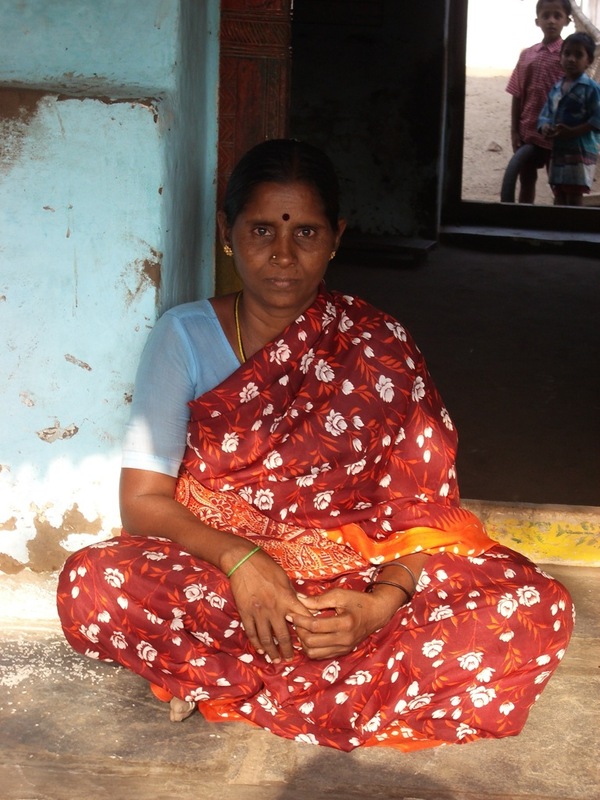 Lakshamamma headed a village self-help group where women took loans. 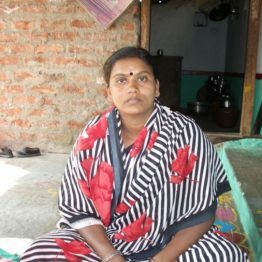 Now she is mayor of her village of Cherlapatelguda. 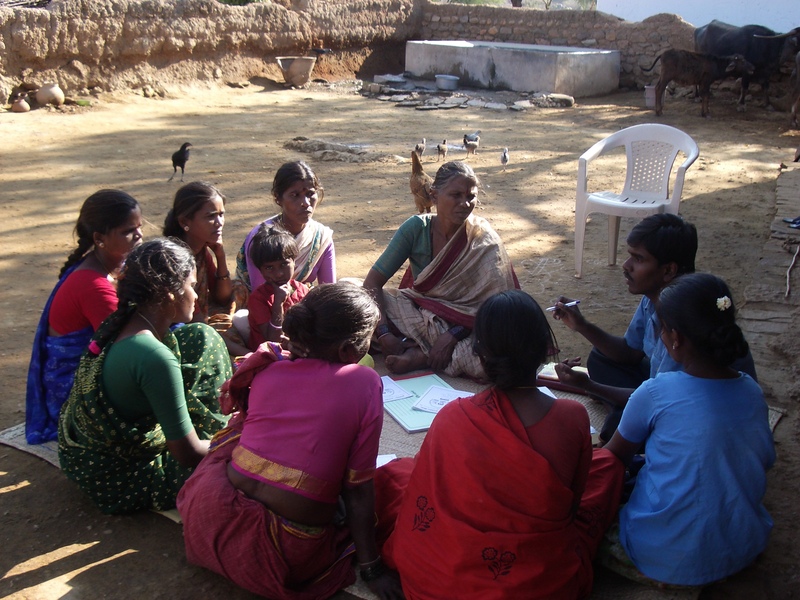 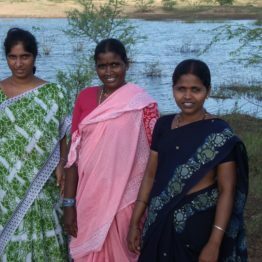 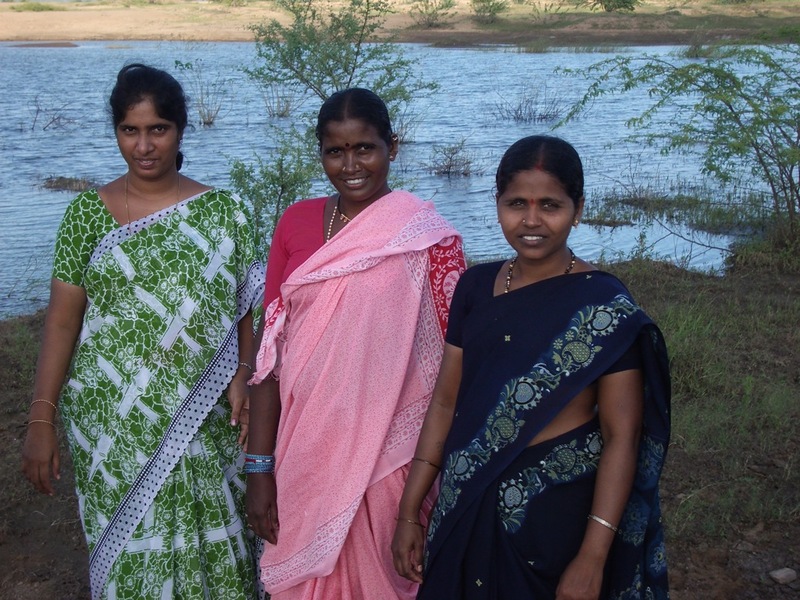 Sugunamma leads a farm improvement group. 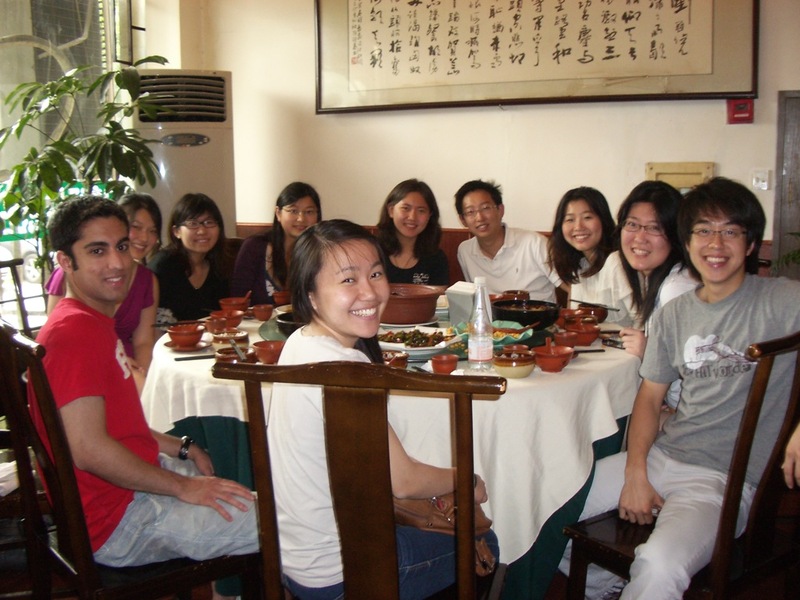 University of Pennsylvania China Team. 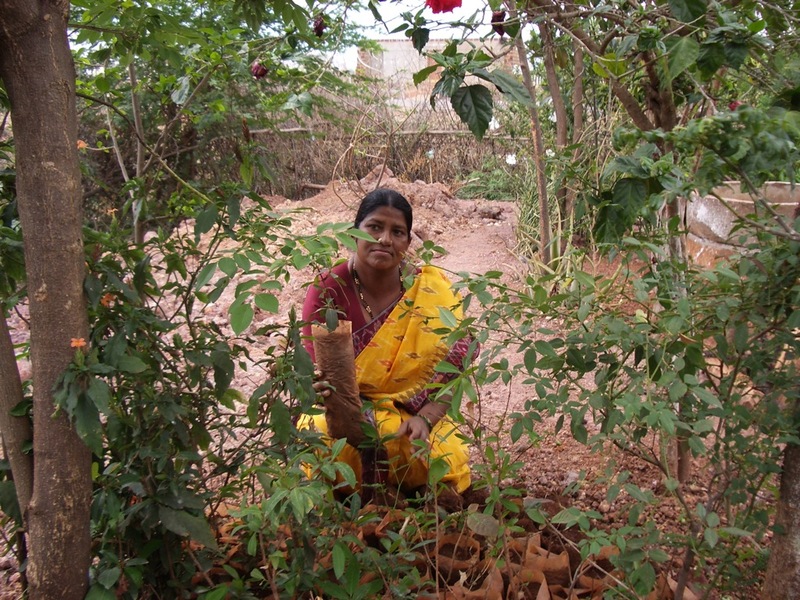 Anusuyamma runs a tree planting project involving women in 28 villages. 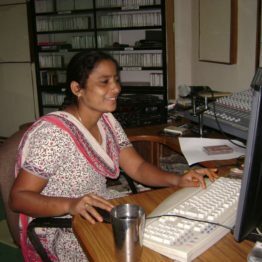 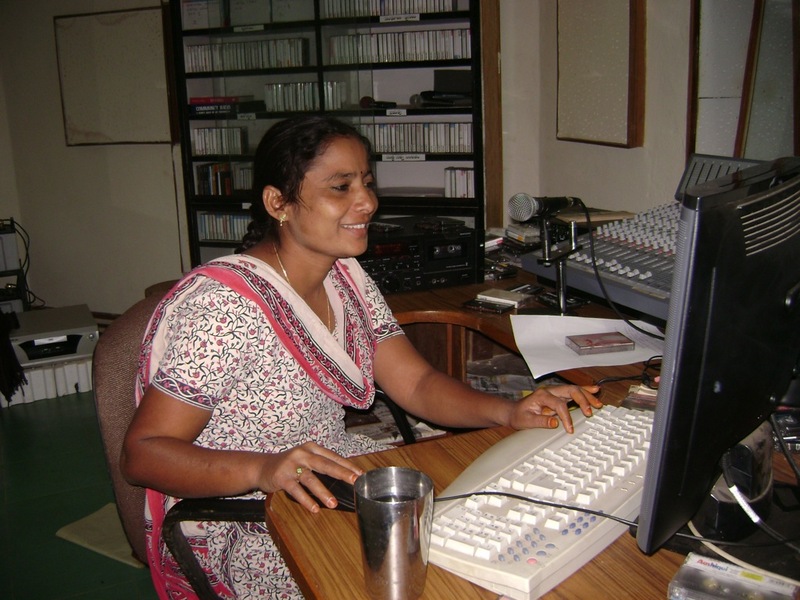 Narsamma runs a village radio station emphasizing social and economic developments. 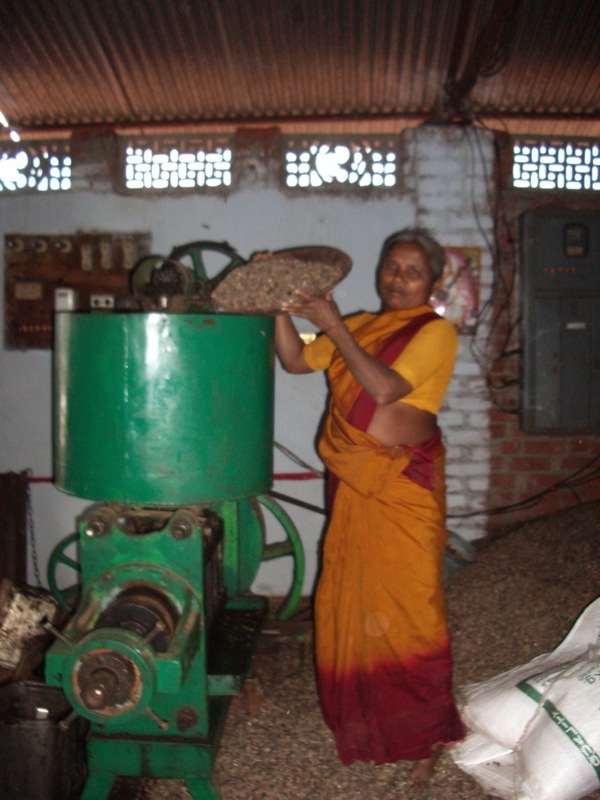 Shammamma heads a women’s collective that has created a factory that presses oil from neem seeds for sale as an organic pesticide. 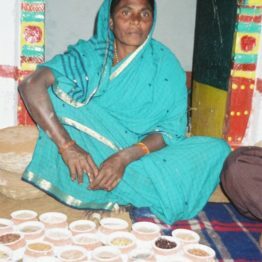 Seedkeeper Anjamma made the deserts bloom by taking microcredit loans for organic farming. 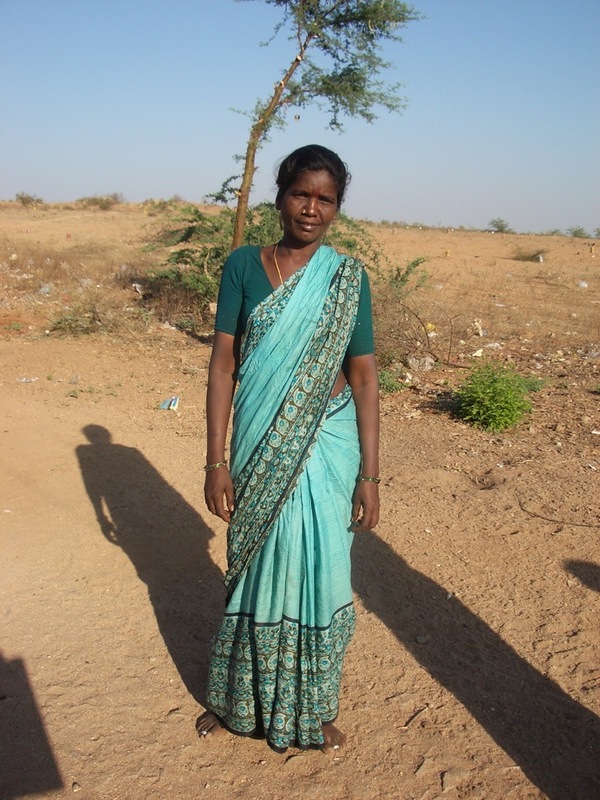 She belongs to the Deccan Development Society (DDS) with 5,000 Dalit (untouchable caste) women. 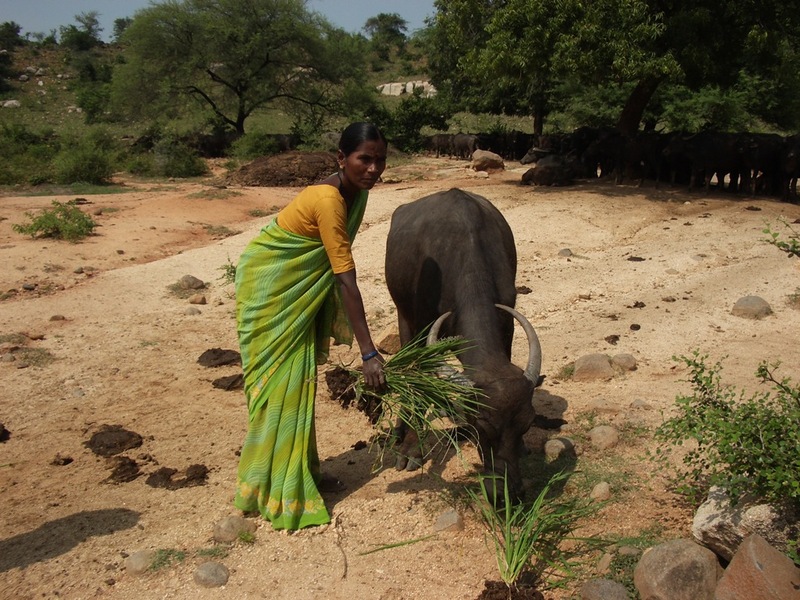 Women cow owners are shareholders in their new dairy. 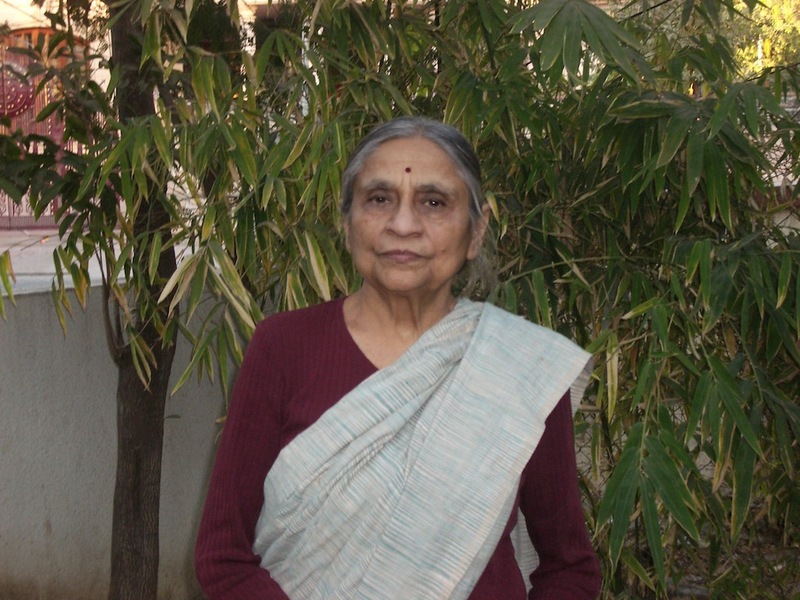 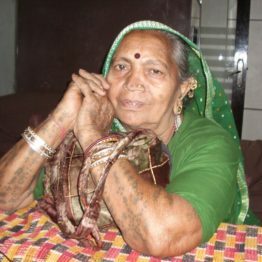 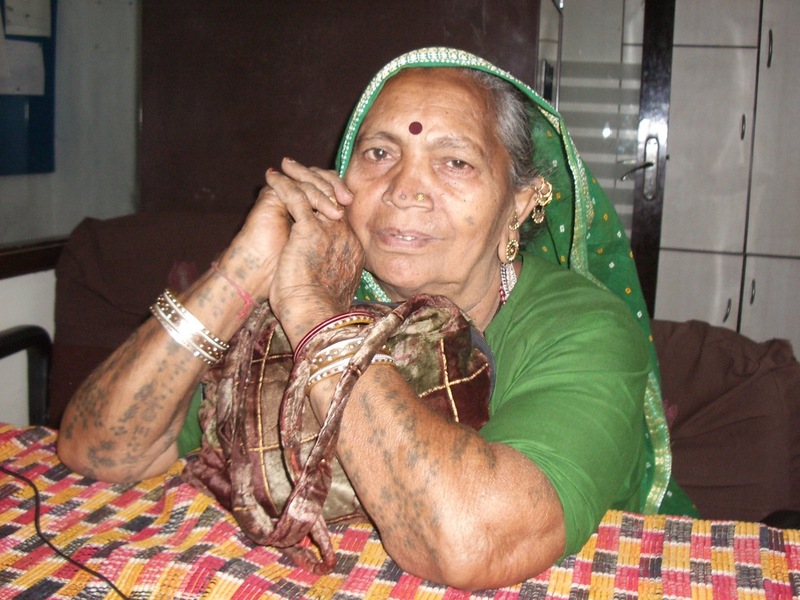 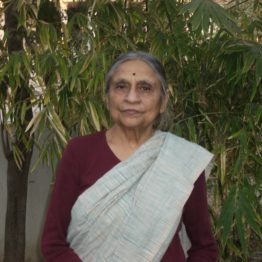 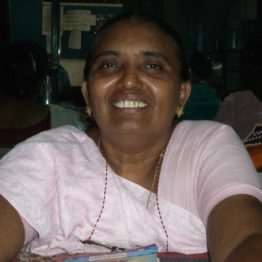 In the state of Gujarat Ela Bhatt started the Self-Employed Women's Association (SEWA) that now has one million members. 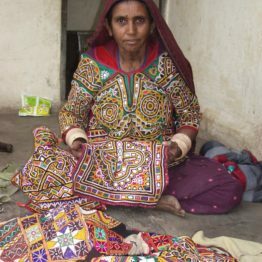 Master embroiderer Puriben of SEWA helped start a village-based embroidery company that has drawn families out of poverty. 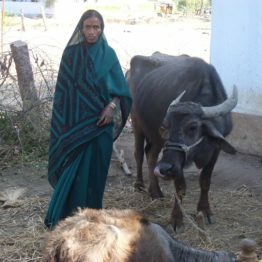 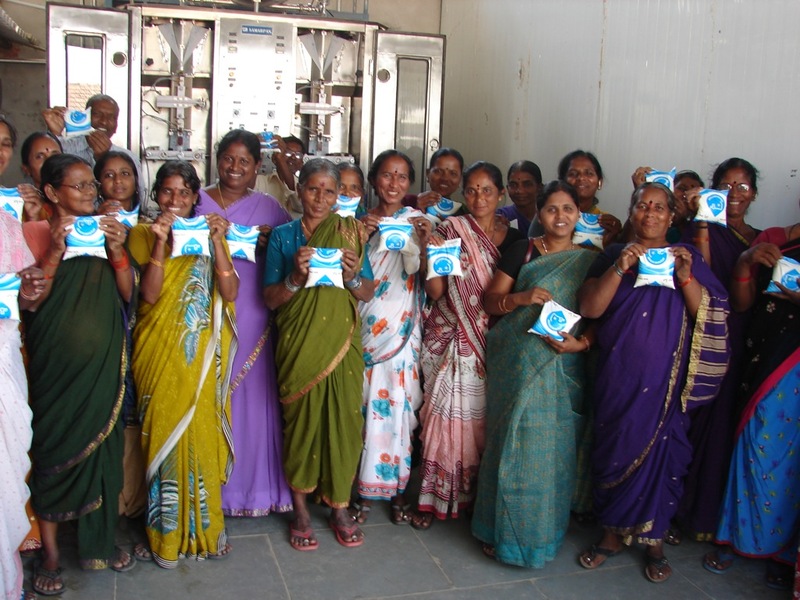 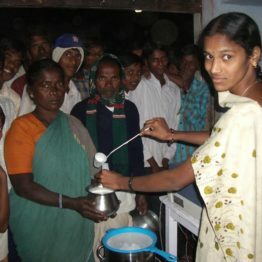 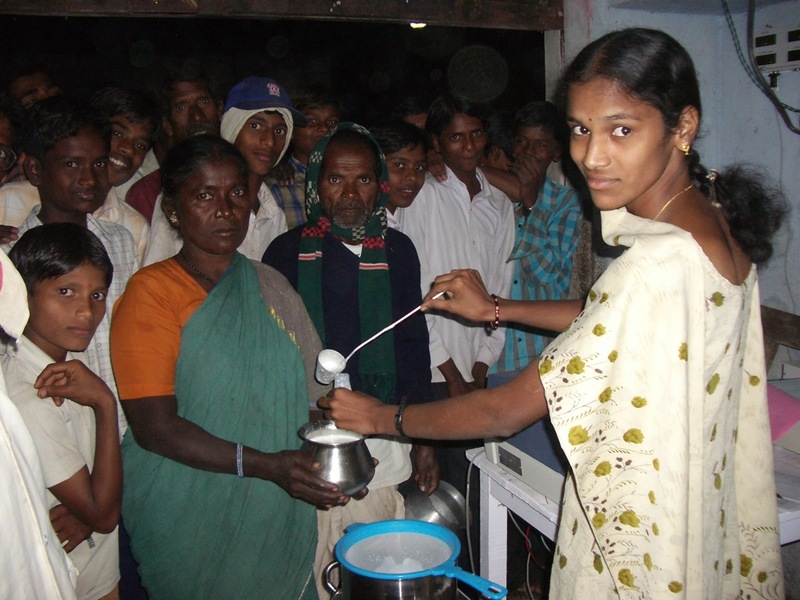 Milk buffalo owner Poorova is one of 15,000 women that have started their own dairy through Gram Abhyudaya Mandali NGO. 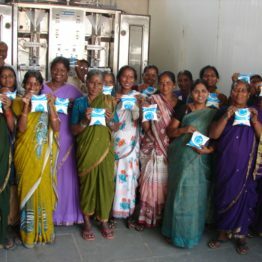 Women bring their milk to the village collection centre. 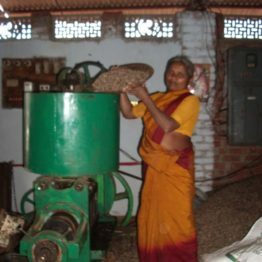 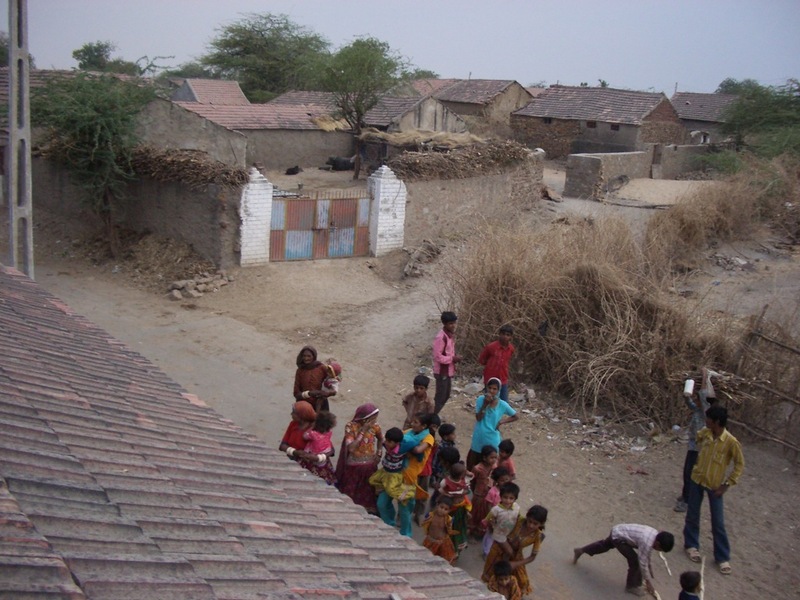 Gram cooperatives composed mostly of Dalit women took a lease to run a municipal sand pit and made money. 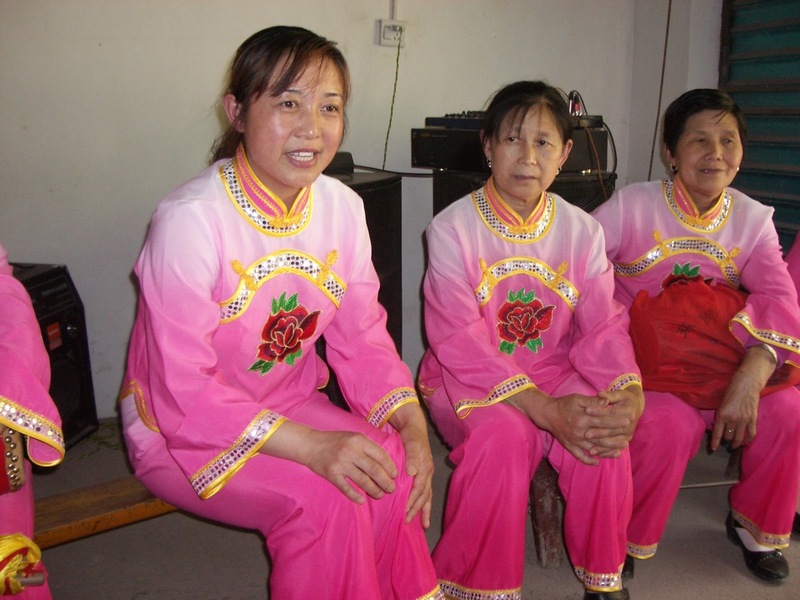 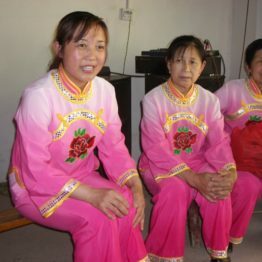 Women from a self-help group want loans to start a kindergarten and old people's home. 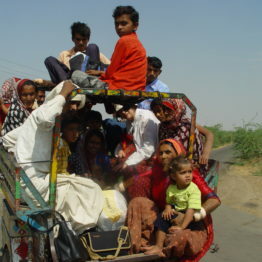 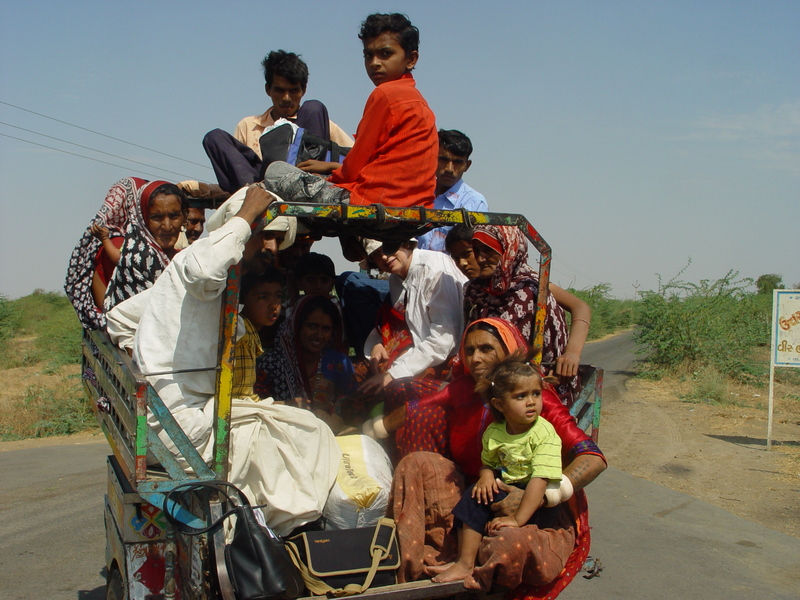 Sheila is squashed into the front in a white shirt, and hanging off the back is Puriben in the red top with her grandchild, en route for a day's work travelling to supervise the work of local embroiderers in the villages she is responsible for. 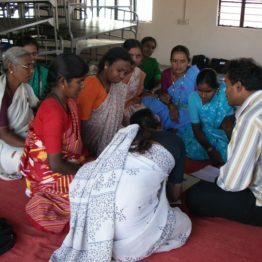 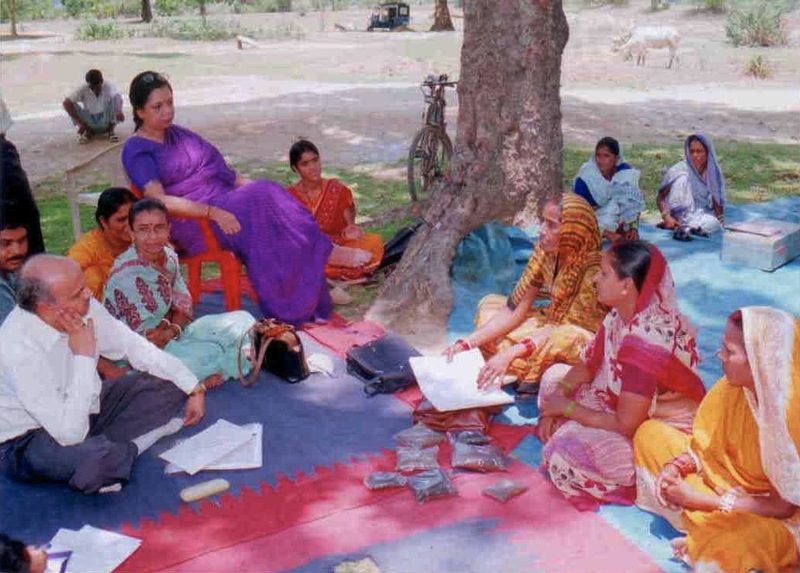 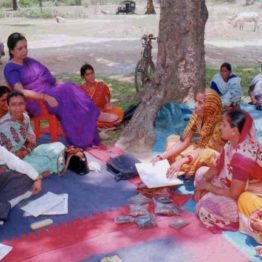 Social Change goes along with women meeting in groups for loans. 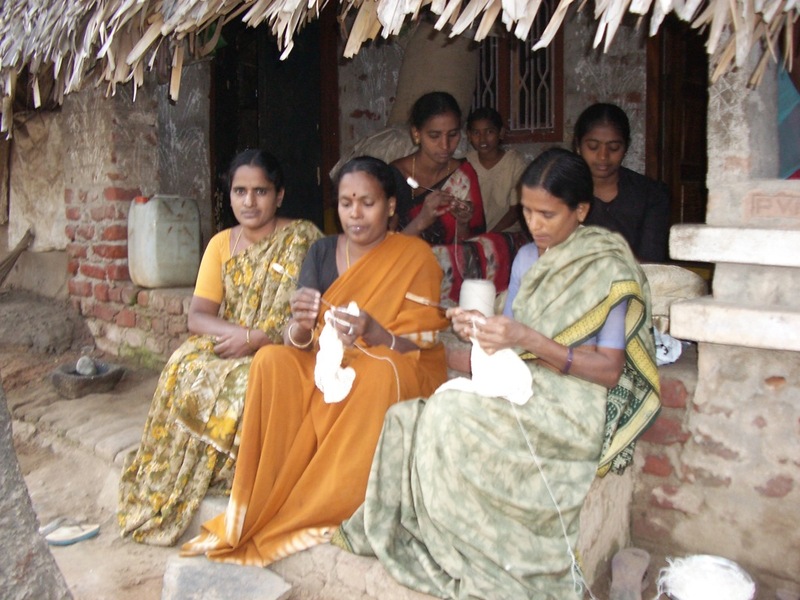 An organization fighting prostitution helped Kista join a microcredit group. 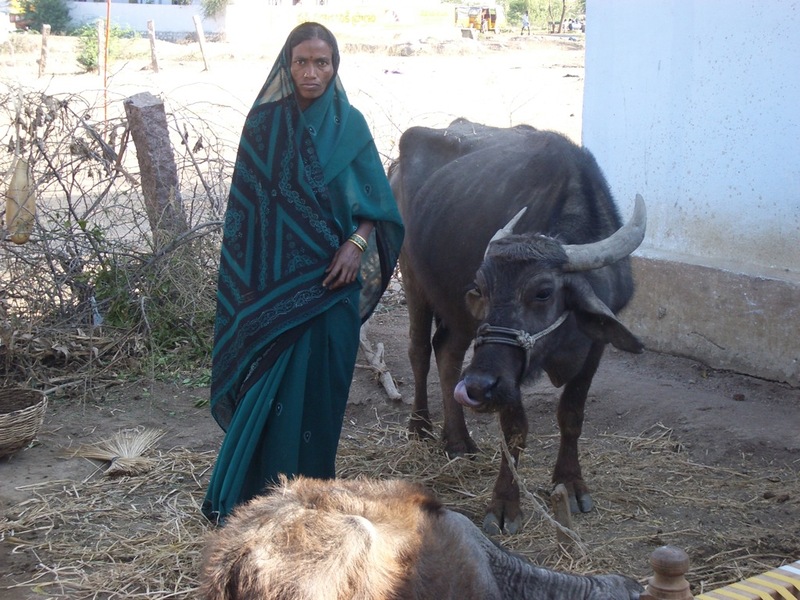 She took loans to develop farmland. 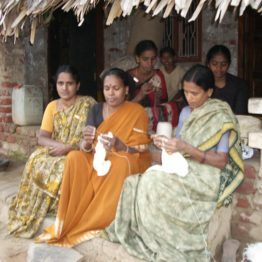 SEWA Embroiderers in Kaliwada village work together. 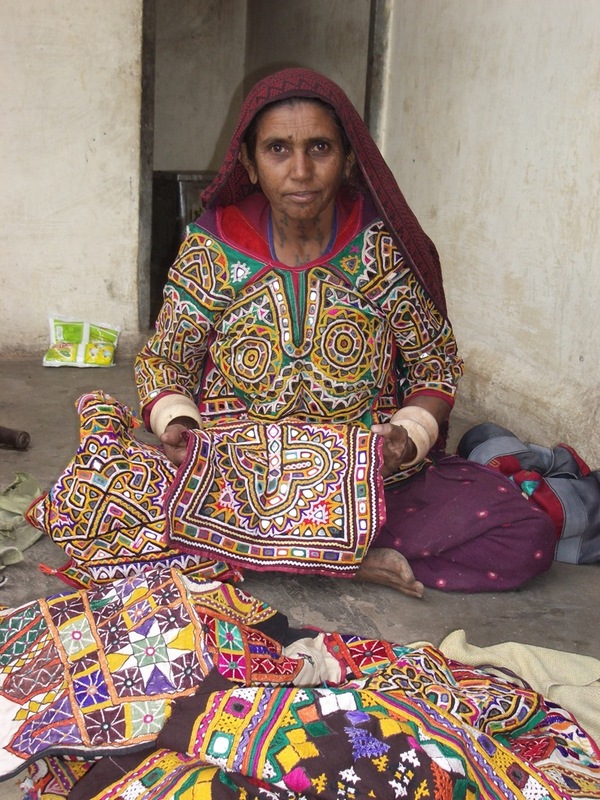 Very poor lace artisans earn only 50 cents a day making cushion covers for IKEA. 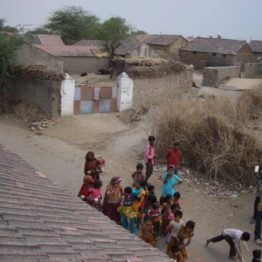 Village where lace artisans work. 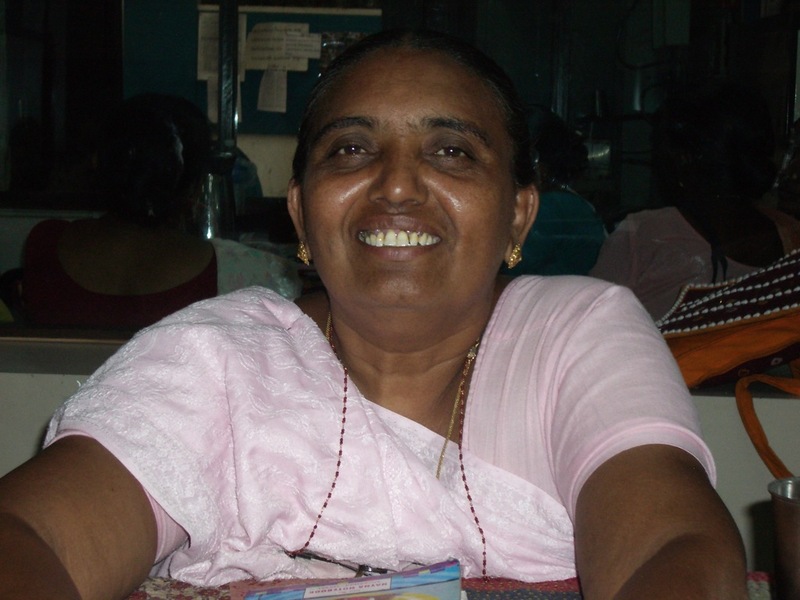 Surya Kumara heads a federation of lace cooperatives linked to IKP. 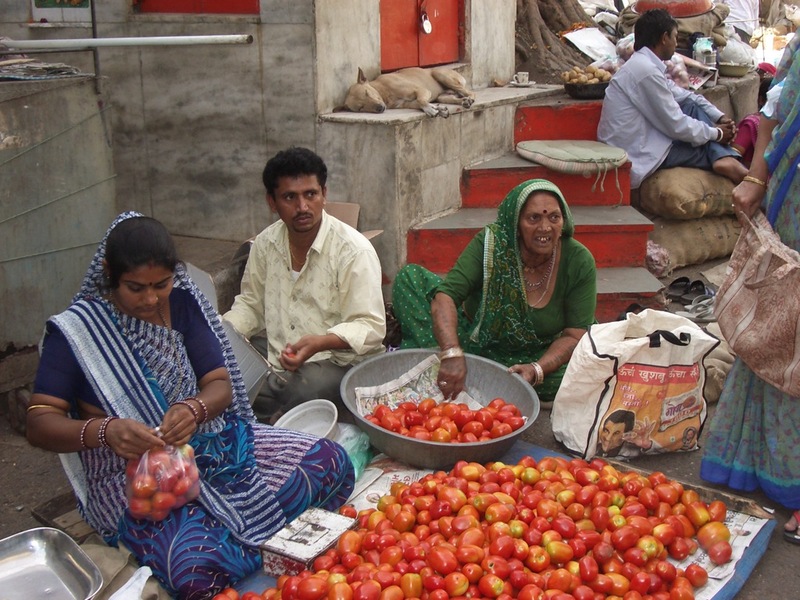 SEWA street vendors intend to buy land and start malls that sell organic produce from SEWA farm women. 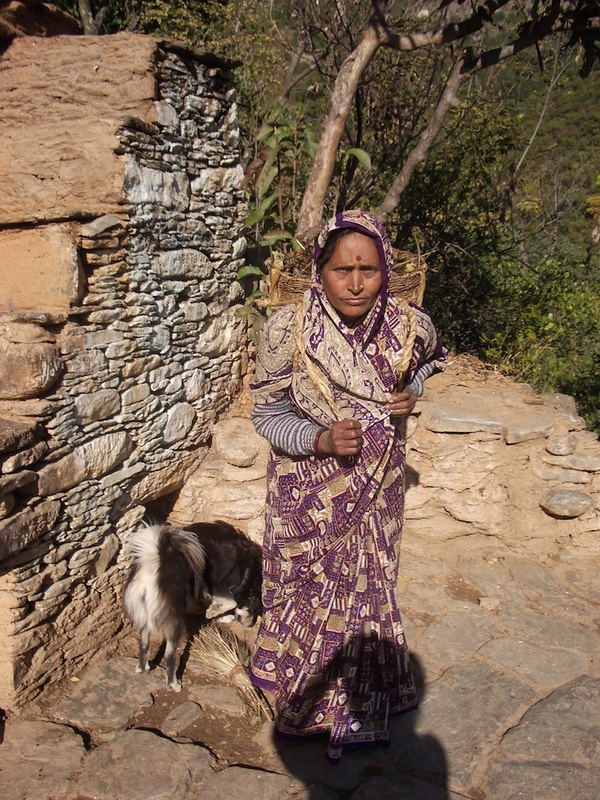 Narvada Purohit with dung on her back prepares to descend the mountain to work on her her land. 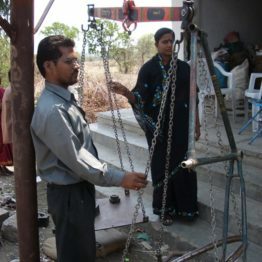 A group of SEWA construction workers have started a construction company called Rachiata. 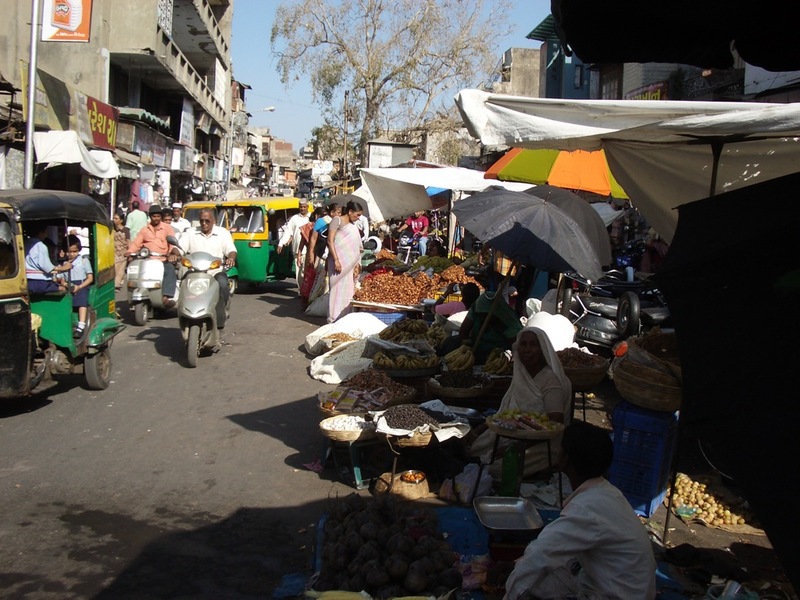 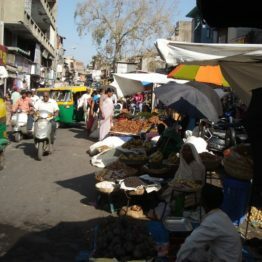 Rajiben sells produce at a market in the city of Ahmedabad. 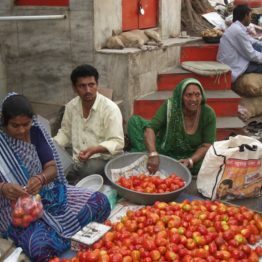 Vegetable vendor Rajiben collected money so SEWA women could start their own bank. 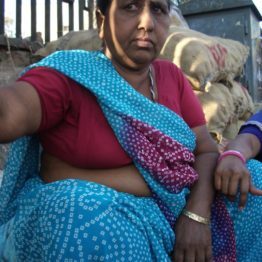 Shantaben Pakmar is a vegetable vendor leader that had to fight police harassment of vendors on the streets of Ahmedabad. 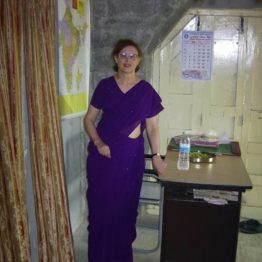 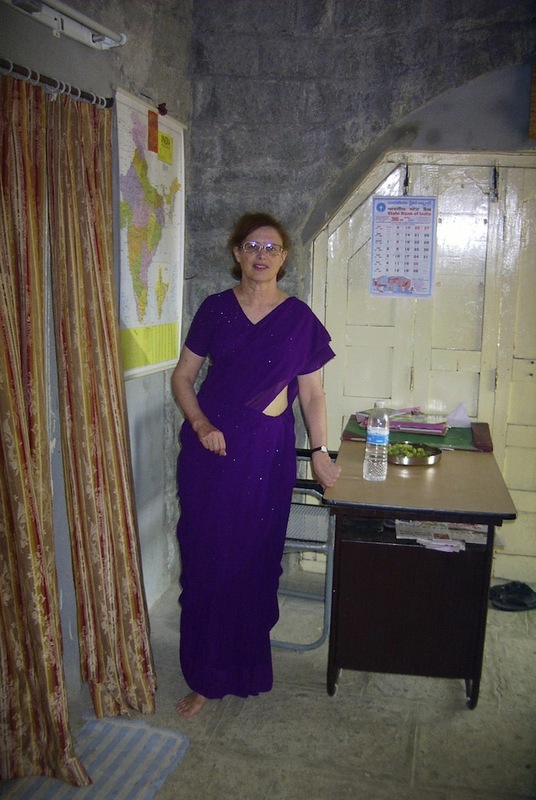 Sheila wears a sari to celebrate opening of school for girl child labourers. 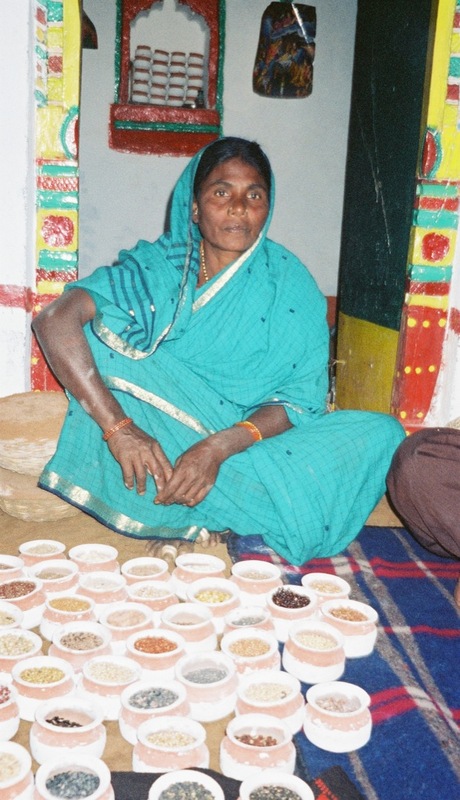 Shandebee runs a village kiosk. 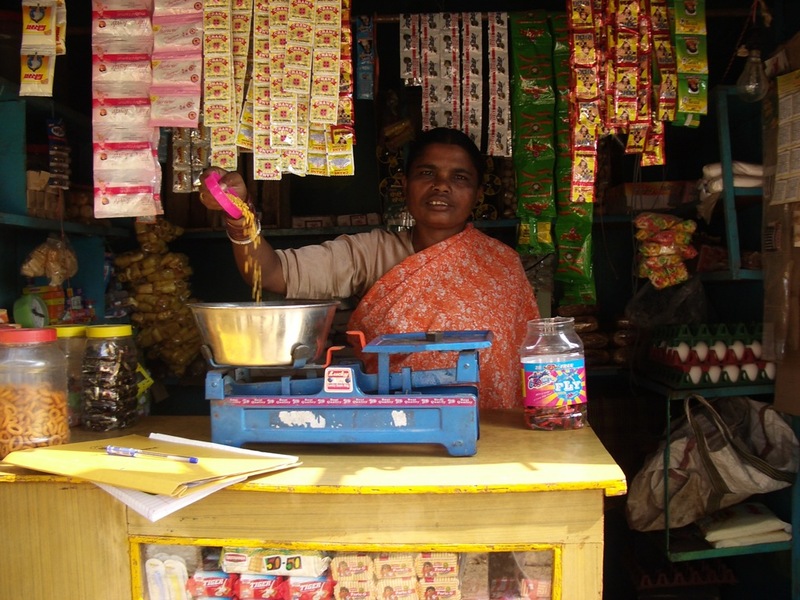 Meerabai started by taking loans for a tea stall. 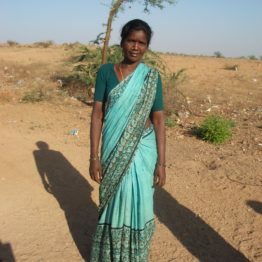 Now she and her husband run a lucrative recycling business. 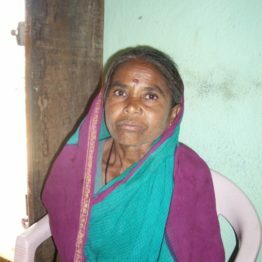 Punnemma was a starving day labourer. 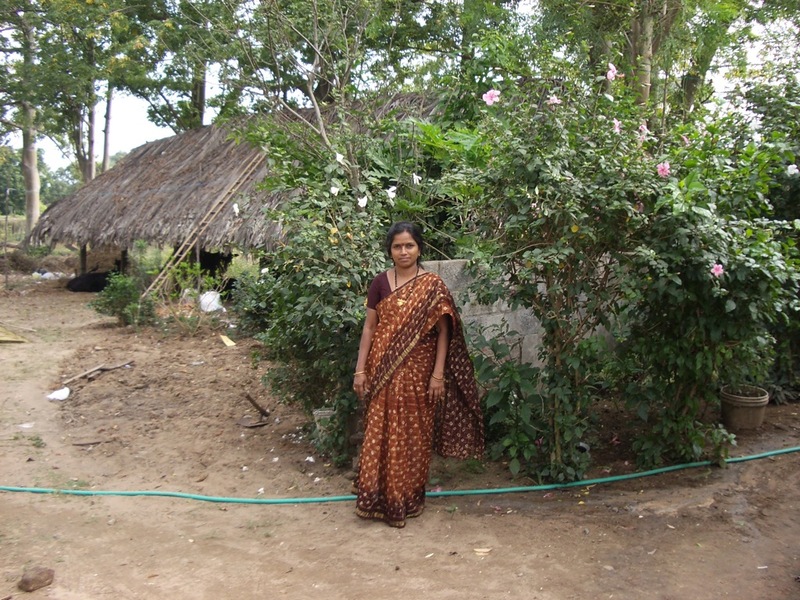 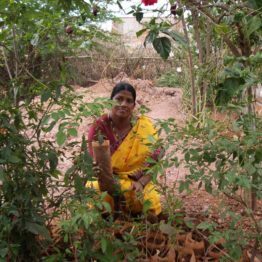 Now, under Swayam Krishi Sangham (SKS) Microfinance, she runs a mini-farm. 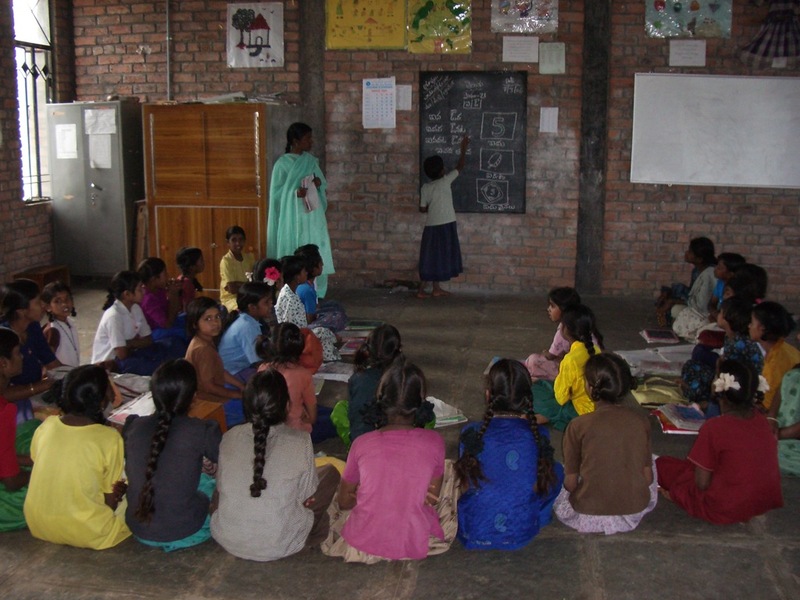 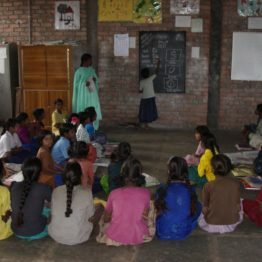 Girl child labourers attend a special 10-month school that prepares them to enter the regular system. 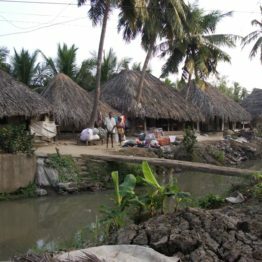 Vauva village was where the enterprise began. 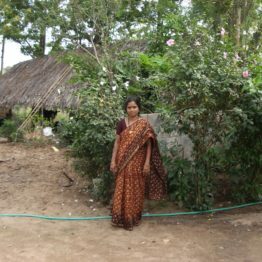 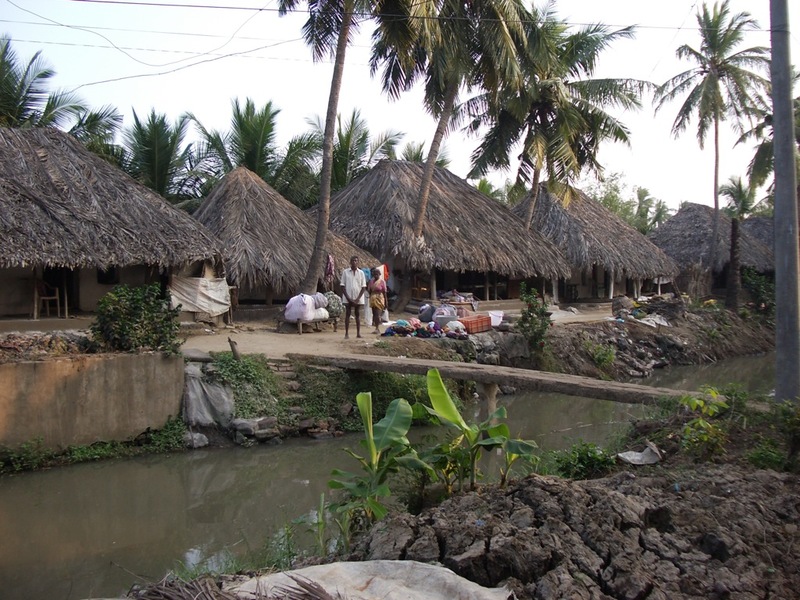 In a fishing village struck by the Tsunami Nagamma has taken a loan to repair her husband's fishing net. 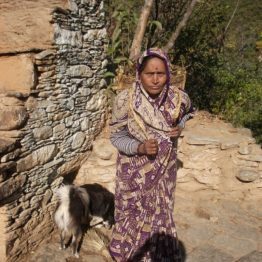 Village journalists put out a social issue newspaper. 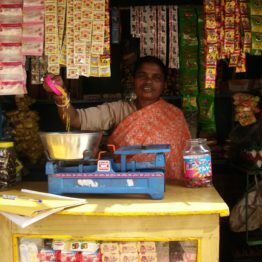 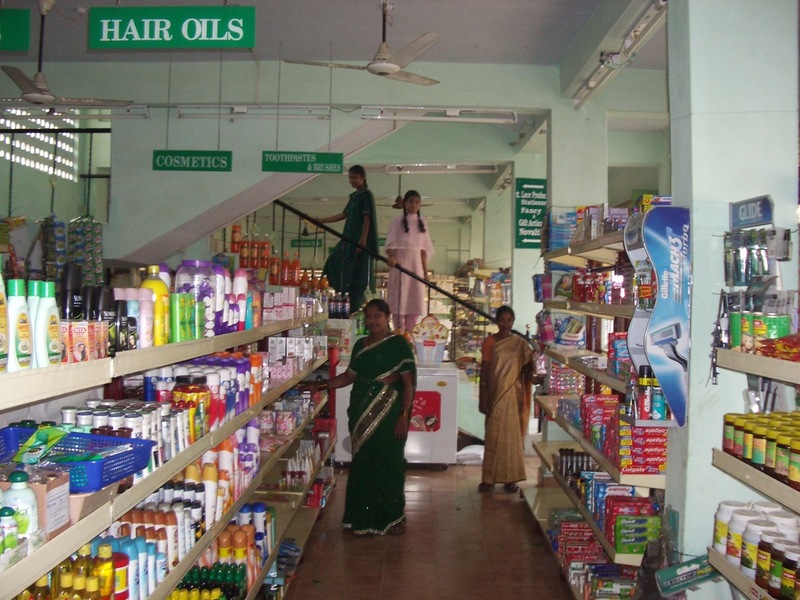 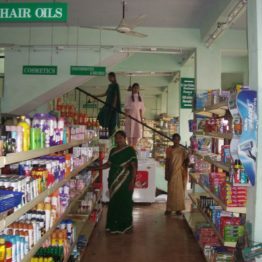 Women run their own market under Indira Kranthi Patham (IKP), a government-run microcredit program with 10 million borrowers in the state of Andhra Pradesh. 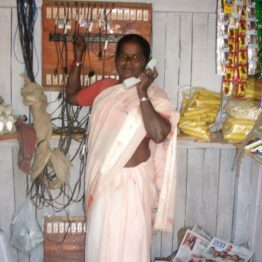 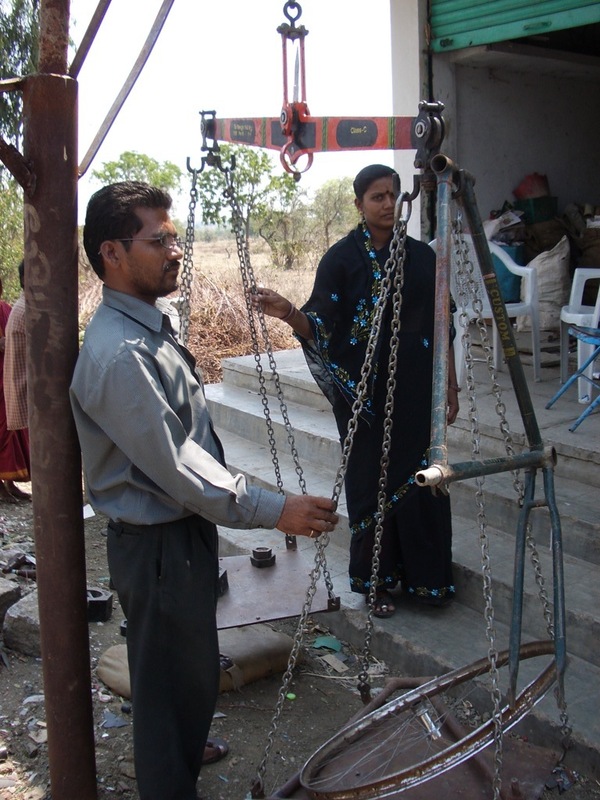 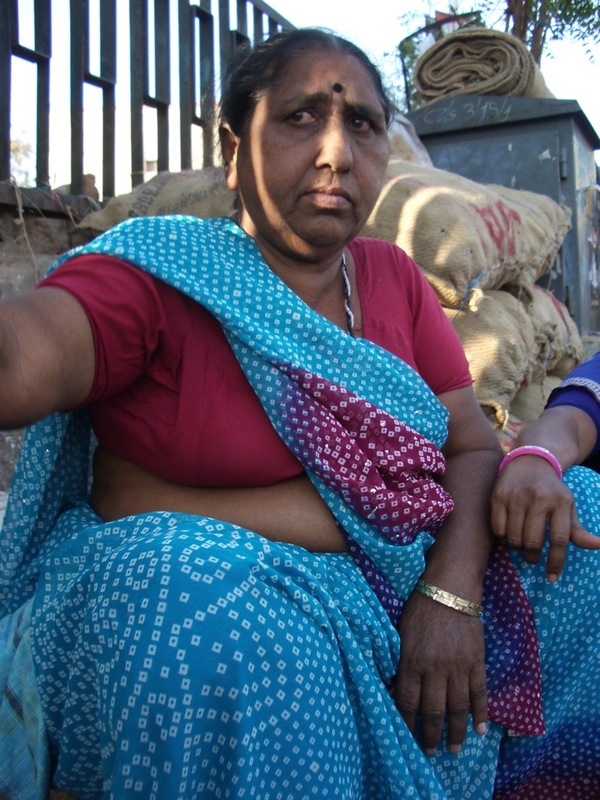 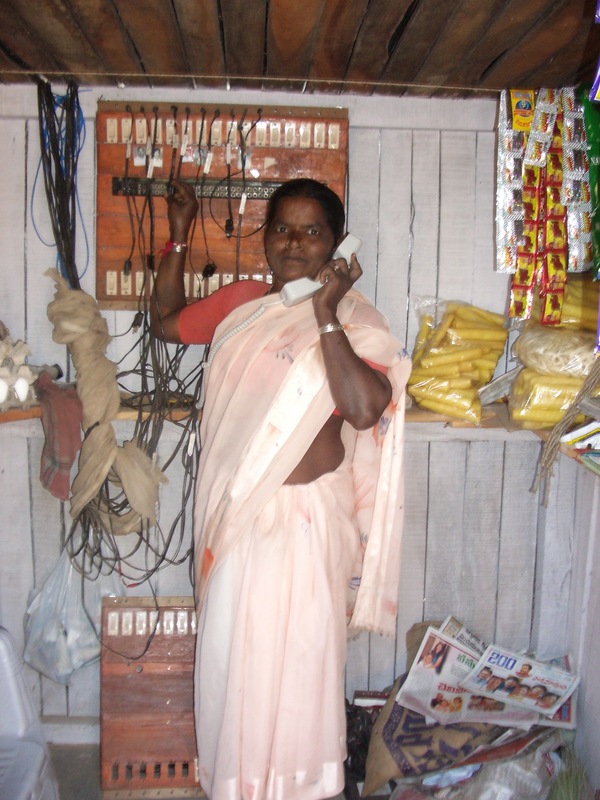 In the village of Cherlapatelguda, Laxshmamma took a loan to open a village phone service.